Call for Riot Grrrl Zine Authors and Readers to Participate Research Project! University of Cambridge grad student Stefanie Carter is looking for authors and readers of Riot Grrrl zines to be interviewed for her research thesis. In her work, she hopes to emphisize the importance of zines and networks of zinesters to the Riot Grrrl movement overall. Because Stefanie is located in the UK, the interview will be recorded over the phone, email, or Skype for US residents. The interview will be approximately one-hour long and will consist of pre-composed questions as well as questions that arise during conversation. If you would be interested in participating in this interview or would like to recieve more information, contact Stefanie at stefanielcarter@gmail.com. Send relevant submissions to theworstzine@gmail.com by August 1st. The Madison InfoShop, a radical resource center in Madison, WI, is launching a digital zine library and oral history project. Get a summary and volunteer info. Looking for some inspiration to spice up your envelopes? Check out the Digital Collection of Mail Art compiled by the University of Buffalo. Wow, Rave Archive has a lot of zines avaliable to read digitally online. They feature zines from the 1990s that document rave and punk music popular at the time from all over the US, UK, and Canada. If you were at Meet Me at the Race Riot earlier this year, then you had the privilegeof seeing Osa Atoe read from her amazing zine Shotgun Seamstress. She is now releasing all six issues as one box set. She's even throwing in a free mixtape! Don't miss this chance to own such an important part of zine punk history! Do you ever read the Missed Connections section of Craigslist and wish that more zinesters showed up? Submit your stories of splitzines, admiration, and/or passionate yearning to Zine Crush! Are you looking for zines on nationality and transition? Do you have any zines to add to the list? Click here to go to CUNY's blog to see Alycia Sellie's growing list of zines! Everyone should take a look at Coloring Outside the Lines, a zine by women of color activists at UCSC in Santa Cruz available online! Pandora Press - Issue 3! 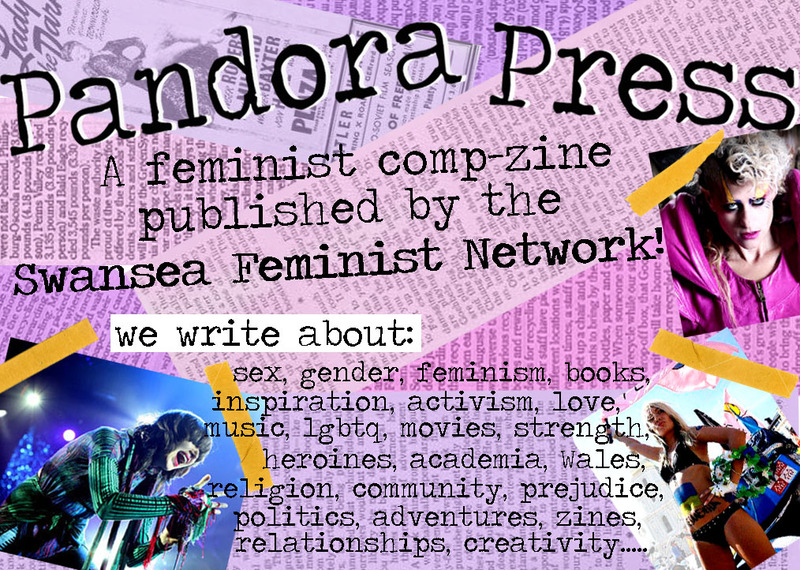 Pandora Press is the Swansea Feminist Network zine. It is a publication written by and for intelligent creative women, which represents what the SFN is all about! You can get involved in any way – get more info on their website!